For over 15 centuries a majestic city, the heart of Rus, the capital of Ukraine stands on the Dniper banks. This is the ancient and ever-young Kiev. Like a magnet it attracts tourists from all over the world because it is a unique city. Kyiv is a city that successfully combines different architectural styles – ancient buildings can be found next to the most modern constructions. This is a city where different religions live at peace - Kyiv monasteries, churches and synagogues welcome worshippers and architecture admirers. 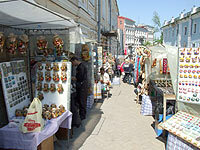 Kiev is a city of different cultures and nationalities; it’s a place where both Russian and Ukrainian are spoken. Here you will be understood as younger people speak English and other European languages. In the central part of the city there are carefully preserved and restored ancient sights that are more than 1,000 years old. This part of the city is called Old Kiev. Kiev is fun to walk around as it allows you to see so much more, giving you the opportunity to ‘touch’ history. We recommend starting your meeting with Kiev from the remnants of the Golden Gate – once the main entrance into the ancient city. It was build during the rule of Yaroslav the Wise at the beginning of XI century. In the Golden Gate square you will see a statue of Yaroslav. We will go down Volodymyrska Street, which used to be the main city street, to Kyiv’s oldest standing church, the outstanding St Sophia’s Cathedral. In Sophia Square stands a monument to Bogdan Khmelnitsky that dates back to the end of XIX century. We will then move on to Mykhailivska Square. On our way we’ll see a monument to Princess Olga, St Cyril and St Methodius (the founders of the Slavic alphabet and literacy) and a moving monument to the victims of the great famine of 1933. We will visit Mykhaylivskyi Zolotoverkhyi Monastyr (St Michael’s Gold-Dommed Monastery); go to Volodymyrska Hirka (Volodymyr’s Hill) where there is a monument to Prince Volodymyr the Great who brought Christianity to the eastern Slavs in 988. Then we’ll go down Desyatynna Street to the ruins of Desyatynna Church which are on the territory of the National Museum of Ukrainian History. You will get a great view of the magnificent St Andrew’s Church – the gem of Ukrainian baroque. Art galleries, museums and just picturesque corners – this is all Andriyivskyi Uzviz (Andrew’s Descent). It’s a dearly beloved and charming street, a museum street, a trade-fair street where you will definitely find something interesting and useful – a souvenir from Kyiv.